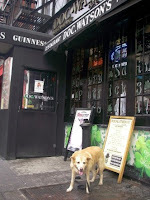 McMena's St. Patrick's New York City tour of Irish hangouts. 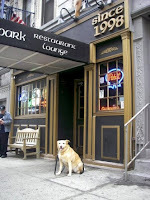 An Irish pub in New York City? That's hard to find. A internet search reveals there are more than nine-thousand in the area! Mena can't make them all, but click here for links to some of the most popular. 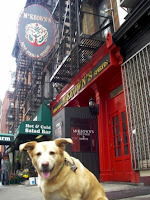 In the spirit of the Willabeast's Haunted Tour of NYC, McMena stakes out the Upper East and West sides for places that at least have an Irish feel. I'm assuming they have good whiskey here. It was the cause of both the fall and resurrection of Finnegan. You can also order Bangers & Mash, Steak & Kidney Pie, Shepherd's Pie and Fish & Chips. 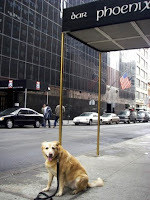 However, Willamena was intrigued by the green sign looking behind the awning of Finnegan's Wake. So let's zoom in. Kinda funny being in the search for Shamrocks we find Shamrat. Seriously though, a nice alternative to whiskey or the pint any time is Chai. Shamrat has it listed on the menu as Indian spiced tea. 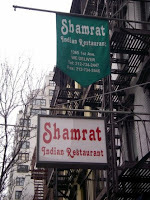 While Willamena hasn't had the Shamrat version, she highly recommends trying it at any Indian place. Her favorite, however, is still at the Cosmic Cafe in Dallas. This place is wishing you a Happy St. Patrick's Day. That's what it says on the door. Mena was just here too early. She was told by a cute irish looking boy on the corner eating a sandwich that it is usually open. A check of the hours reveals it opens at noon Monday through Friday, but not until 6:00 pm on Saturdays. Check out choice with your chips: Whiting & Chips, Tilapia & Chips, Cod & Chips, Catfish & Chips, Chicken & Chips, Shrimp & Chips, even Crabsticks & Chips. You can also get Teriyaki and sushi rolls. 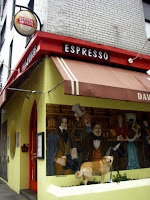 Just a half block from Cork & Fin a Guiness sign screams at you from David Copperfield's. Okay. So Charles Dickens was English, and this is an ale house. But it does serve Irish fare including Bangers & Mash and Shepherd's Pie. Plus just how happy the four of us look. 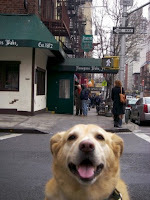 Proof people in Manhattan are friendly and you can hand your camera over to strangers who ask if you want to be in the picture with your dog. McMena had a thing for this Menu. Check out her smile. While you are at it, check the Brunch deal. (Click on the photos to enlarge.) $10.95 includes an entree, such as Baked beans on toast, and TWO drinks. Ten bucks is what one drink will cost you at some NYC brunches. This place is all Irish. It offers traditional fare, including Irish Stew and even Irish-style chicken curry. There is a fireplace as well as stained-glass window detailing inside. Check out his lounge the newshound sniffed out. 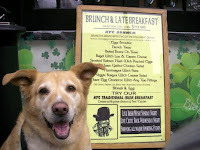 Its menu lists burgers and traditonal Irish fare. Actually, its the first place on this tour to have Corned beef & Cabbage on the menu. Phoenix Park in Dublin is the largest urban enclosed park in Europe. It is bigger than NY's Central Park. Has Mena done a Central Park tour yet? Stay tuned. If I was Irish I would really love NY. You don't have to be Irish to love NY- I'm only 1/5th Irish. So how about this- you a baseball fan? 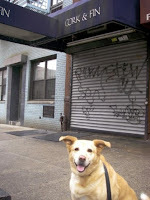 Mena will tour NY's hotdog hotspots- showing you where you can get dogs from one dollar to 40-dollars! What a good girl Willamena is. I can't believe how she will sit with the leash on the ground, and pose. Happy St. Patrick's Day in advance!